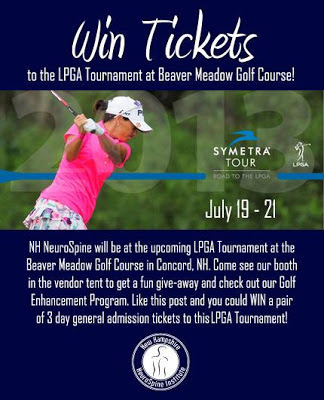 NH NeuroSpine will be at the upcoming LPGA Tournament at the Beaver Meadow Golf Course in Concord, NH, taking place Friday, July 19 through Sunday July 21. Come see our booth in the vendor tent to get a fun give-away and check out our Golf Enhancement Program. Like this post and you could win a pair of 3 day general admission tickets to this LPGA Tournament! Click here to visit our Facebook today!